Agile teams across the world are familiar with Jira – the collaboration tool designed for issue and project tracking developed by Atlassian. While the basic use of Jira is to track issues, bugs etc. with your mobile and software apps, many teams have extended its use beyond just planning, managing and reporting. For example, some DevOps teams like using Jira for test case management. And with a little creativity, a little customization, it can absolutely be configured to support test case management. If your dev and test teams are extremely partial to Jira and would rather use it for test management, here are few tips that can help you customize Jira for managing testing. Jira is a powerful tool with various customization options. You can modify it to a huge variety of use cases. Test management is one of those use cases. Here I’ll discuss how to customize your Jira for Test Management. Note: It is important to have admin rights and a backup copy of Jira before you start to customize it for test management so that you can test it sufficiently (or restart if needed). I assume you already know how to create a new issue type. However, I’d like to remark Jira issues normally ought to be pushed to ‘done’. As a result, there’s a challenge when you want to rerun or reuse tests. You would need to keep it open. Also, it’s quite difficult to keep track of all your test data when you manage test cases as Jira issues. This creates problems when you try to create test coverage reports from different sources. User stories present the same challenges as Jira issues. Reusing tests will still pose a challenge. And since Jira doesn’t have a built-in testing function(it was never intended to be used for testing), this further compounds the issue. Another issue is that you might find yourself moving to ‘done’ status before you are really through with the test. To resolve this you need to tweak the workflow so that the test status is not ‘done’ until you are actually done. But this just means adding more steps to the manual process. Is there a more effective way of test management in Jira? The truth is that Jira is not really meant for test management. And yet, many organizations are using it for that reason. Whether you follow the Agile methodology or waterfall, each test run is important. Tracking the results, managing and monitoring data from both manual and automated tests is necessary. The reason for Jira’s popularity is that it keeps development on track with its issue-tracking capabilities. However, testing and QA are a different story altogether. You can’t revert to lengthy manual steps and processes ‘just to make it work’. You can’t afford to lose visibility on the development progress or match issues with the test cases. So, what you really need is a Jira test case management plugin. There’s multiple Jira apps to handle test case management. However in this article we will demonstrate this point using QMetry’s Test Management for Jira. Which was designed to fix all of the challenges mentioned above and extend Jira’s use for test management. With a test case management app you can implement end-to-end test management, creation of test cases to linking existing test cases to stories. You’ll also be able to group test cases to create scenarios, assign testers, save test results, track execution history and automatically maintain the audit of test artifact changes. All use cases are extendable. 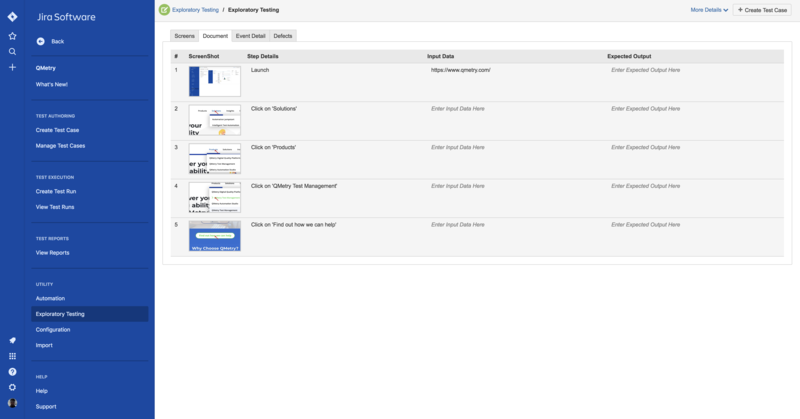 You can also extend Jira workflows on QMetry Test assets. Or if you like, you can migrate historic data from other tools and continue to strengthen the quality of your test suite. With a test management plugin for Jira, you’ll also have dedicated reporting options. QMetry’s reporting feature offers coverage analytics, test runs and end-to-end traceability within the system. Although I’m sure other apps offer similar features. Get real-time visibility on projects and teams for various reports. You can build your own customized dashboards and release with confidence using the executive coverage, reusability and various other insights. You can implement end-to-end Agile/DevOps integrations using the Qmetry open APIs to connect with a wide range of automation and CI/CD tools. Import your automation test results directly into Jira, by integrating with CI/CD tools such as Jenkins and Bamboo, and test automation tools like QMetry Automation Studio, Selenium, Appium, UFT, etc. You can manage both manual and automation test results including exceptions in the test runs. Automatically record all actions and create annotated screenshots with an integrated exploratory testing app. It enables you to export bug details with screenshots, environment details, add assertions, annotations, record voice memos. In short, it allows you to do more with the app in a less time with a quick and intuitive way to document your exploratory testing efforts. Be it to export/import your test assets, migrate historic data from various tools or get a prompt response to your query. QMetry is fully compatible with Cloud, Server and Data Center. By using modern test management apps, you integrate QA tracking, testing and analysis in each phase of the software development process – thereby becoming truly agile. Your teams can move faster, identify problems earlier and with more accuracy, and release better quality updates. You can significantly improve code quality by integrating a testing app directly inside Jira. This means tighter integration of product management, development and testing teams within the same environment. You can streamline efficiency and productivity using a single app.